Another trip to St. Joseph County and another new restaurant blog. This time I wasn’t going to see my in-laws though. I got sent to Constantine for work so it was me and a co-worker make the trip down 131. Our task in Constantine was quick. We were done in about twenty minutes then it was time to head back to Kalamazoo. I was pretty hungry though and while there aren’t a lot of options in Constantine for a quick lunch, one popped in my head pretty quickly. I called in my order as we were finishing up at the job site and was told it would take about ten minutes which I thought sounded quick but was actually a really good thing. I took my time finishing up what I was doing and driving across town. Parking is along the not quite as busy as it used to be street that used to be US-131 but now is just the Business Loop as the highway actually goes around town now. The restaurant is much bigger than I thought it would be and has quite a bit of seating. 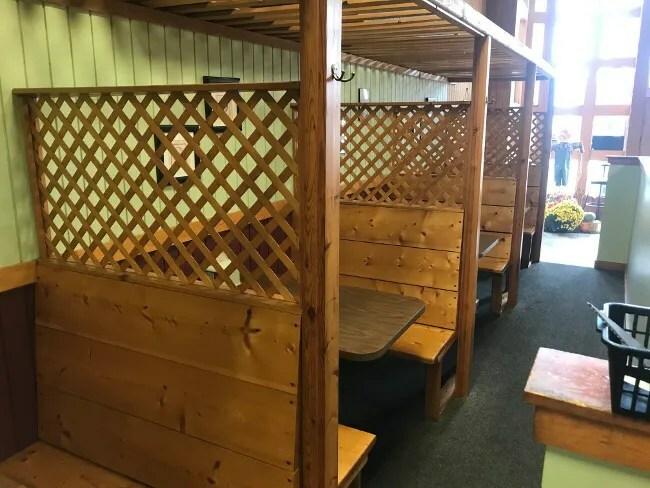 Most of that is along one wall in semi-private wood booths. There’s an interesting combination of lime green paint and porch fencing that give the building a distinct look. The order counter is a window cut out of the wall in the back. The menu hangs above the window on old Pepsi sign boards. There was a large group of construction workers in front of me putting in their orders so it took a few minutes longer than it should have but my whole pizza grinder was waiting for me when I got to the front. The sandwich was a little under $10 before tip which I paid for on my card. I grabbed the large bag then headed back to the car to make the trip back to Kalamazoo. The sandwich was pretty much what I expected it to be…a long piece of bread filled with pepperoni, marinara sauce, and mozzarella cheese. The sandwich is baked in a pizza oven instead of the conveyor oven’s that places like Mancino’s use. The bread was a little soft and didn’t have the crunchy bits around the edges but it still had great flavor. 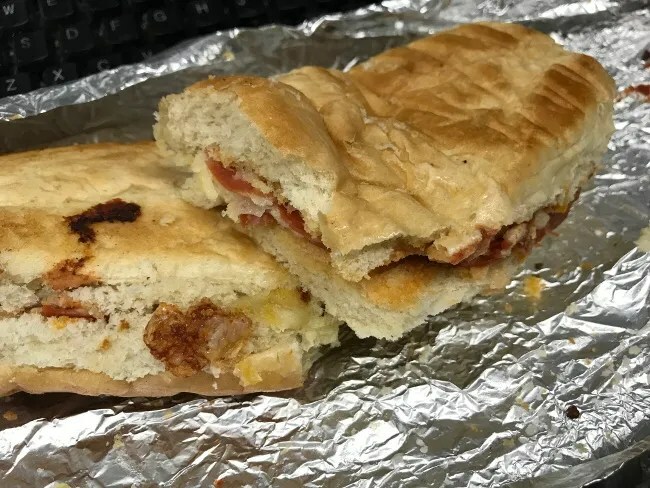 The sandwich had a pretty thick layer of cheese and pepperoni which really gave the sandwich a little bit of a spicy kick. 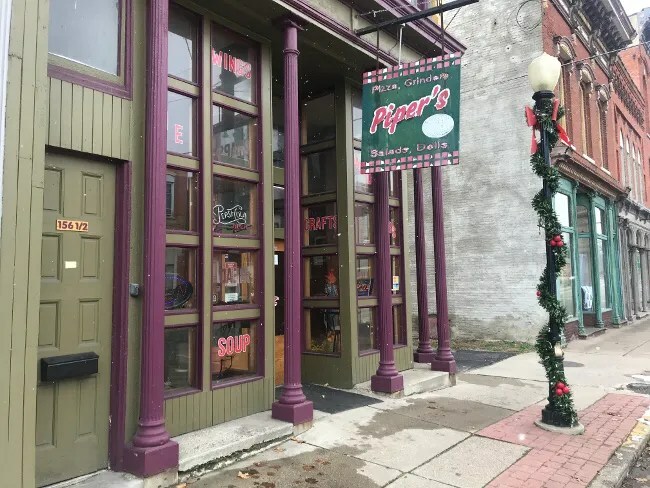 Piper’s Grinders Galore is the epitome of a home town pizza place. They crank out a pretty extensive menu of sandwiches alongside pizzas. My in-laws live pretty close to Sturgis now and we will start exploring pizza places there soon. 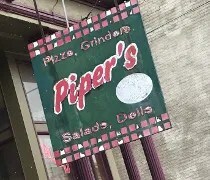 I will definitely recommend the Piper’s there based on this experience in Constantine. [Irrelevant. 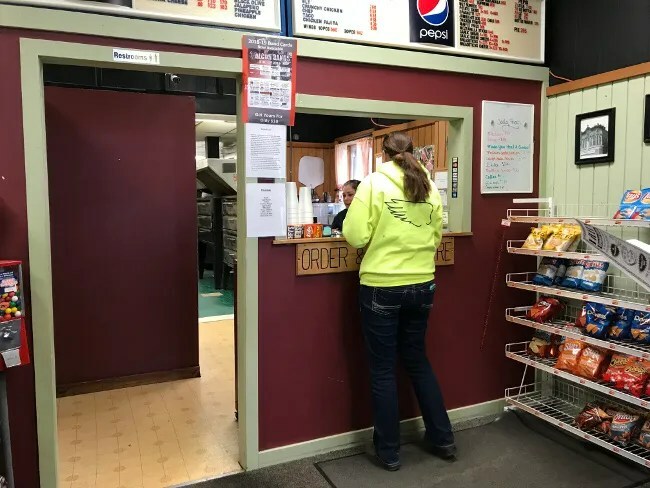 As I explained earlier, the restaurants have no connection to each other] It’s not going to win any big pizza awards but it is the kind of place you will miss once you move away.